Meeting at Hyderabad on July 30, 2011, we the citizens of Hyderabad join citizens from other parts of India in voicing our loudest protest against UID/Aadhaar Number and demand its scrapping, since we view it as one of the most intrusive, coercive and anti democratic acts of the Government of India. We believe that the UID Aadhaar heralds the emergence of a surveillance state and goes against the very grain of the largest democracy in the world. We underline several of the intimidative aspects of the current UID/Aadhaar initiative. The old maxim, 'If you have nothing to hide, you have nothing to fear' has been given a very public burial. Who is afraid of scrutiny in a context where corporate contributions to political parties are all set to be raised to 7.5 per cent from the existing 5 per cent of the average net profits during the three immediately preceding financial years? Parliamentary Standing Committee on Finance headed by Shri Yashwant Sinha is meeting today in the Lok Sabha Secretariat to hear testimony on National Identification Authority of India Bill (NIAI), 2010. This Bill an after thought because Unique Identification Authority of India (UIDAI) was created in January 2009 through a notification of Planning Commission, not through any ordinance. New Delhi: In a letter to the re-constituted Cabinet Committee on Unique Identification Authority of India related issues, Citizens Forum for Civil Liberties (CFCL) has drawn the attention of its members towards the manifesto titled “2083: A European Declaration of Independence” that has been brought out by the Norwegian gunman and neo-Crusader, Anders Behring Breivik who carried out the heinous attacks on his fellow citizens and his repeated reference to "identification". votary of ethics and transparency in media. Last week while I was in New York, I had the unusual experience of being interviewed about the implications of the phone-hacking scandal in the newsroom of Fox News for Sky TV. So I was being interviewed in the centre of Rupert Murdoch's news empire in America for the satellite TV channel where his son James is chairman and in which, at least until last week, his News Corp master vehicle was trying to buy out the outside shareholders. What happened in the interview was revealing about some aspects of this scandal which have yet to come into full focus. What is the take away for us, the Indian press and our TV channels keep asking, as they stay riveted to the unspooling of the Murdoch empire’s crimes of commission. There are facetious replies to that as well as serious ones. First, it is unlikely to happen here because our media as an institution is in the business of raking in money rather than handing it out for stories. The hacking on a industrial scale also involved bribing or payouts on the same scale, and which of our tight fisted proprietors would authorize that? Or sanction humongous enough budgets to make it possible? With Rupert Murdoch’s empire engulfed in scandal in the U.K., Michael Tomasky asks whether the trail of wrongdoing could end up consuming the mogul’s many holdings in the U.S. The question every right-thinking American is asking: Is there any chance, please, that this electrifying Murdoch scandal will spread with full force to America? 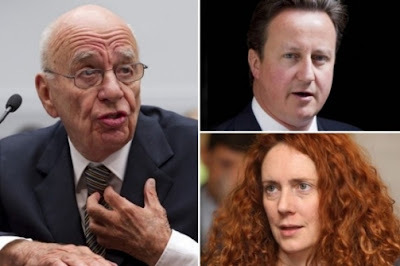 Pleasing as it is to see Rebekah Brooks arrested, she’s not responsible for helping to ruin my country. So I’m not really feeling it like I would if I had the pleasure of seeing Roger Ailes perp-walked into the Midtown South precinct. Alas, I wouldn’t bet on it spreading (beyond Dow Jones CEO Les Hinton, who resigned last week). Fox News and the New York Post commit innumerable sins, but illegal phone-hacking or some kindred behavior seems to me unlikely to be among them. Still, we can dream. Here are three ways the scandal might come stateside. 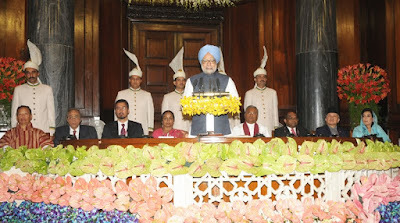 The four-day conference was inaugurated by Prime Minister Manmohan Singh. The themes chosen for discussions at the conference include 'Consolidating Democracy, Strengthening trust between Parliament and People, and Sustainable Development in SAARC Countries - The Way Forward'. “I warmly welcome all the distinguished delegates at the Fifth Conference of the Association of SAARC Speakers and Parliamentarians in India. I extend a special welcome to the delegates from Afghanistan, who are participating in this Conference for the first time. wake of a series of cases before the apex court in which the government’s actions have come under judicial scrutiny for good reasons.